This super adorable Varsity Dog Cardigan Sweater will add to the cuteness of your little or big pup! Made of 80/20 acrylic/wool for a great fit and easy care, sure to keep them comfortable and warm all winter long! Belly area cut to avoid soiling. Fits teacup to large dogs. 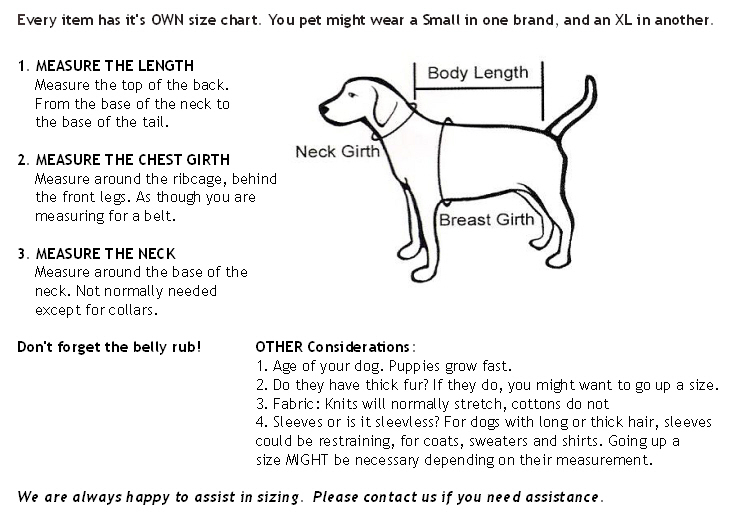 Please remember that every dog is different and might need to wear a size up, especially if your dog has longer, thicker fur, is larger boned, or has a deeper, fuller chest. This might apply especially to sweaters, dresses, or t-shirts, if you prefer a looser fit. Back: Measure from the base of the neck to the base of the tail. Chest: Measure girth all the way around broadest part of chest or rib cage. (This is the MOST IMPORTANT MEASUREMENT) The Back length is the next important measurement. Click the HOW TO MEASURE Tab above for measuring assistance.